When travelling from the direction of Ostbahnhof, get out at Wuhlheide and walk against the direction of the train through the station building. Go up the stairs and keep left. Walk left over the S-Bahn bridge, but don't cross the street! Straight after the bridge, go down the stairs on the left. Keep left and go under the bridge you just crossed. Stay on the left and go under the second train overpass. Keep walking along the wide asphalt path that will take you through the FEZ's park, keeping parallel to the park's railroad tracks. Keep going straight past the playground. If you look northwest you will now see the big FEZ/Landesmusikakademie building. Go around the building on the right, walk past the fountain and you will come to the main entrance. Tram 27 in the direction of Krankenhaus Köpenick. Get out at the station Freizeit- und Erholungszentrum. We would like to draw your attention to the fact that, at certain times when neighbouring organisations are holding events, parking spaces can be very limited. Therefore, during the following times, we strongly recommend using public transport to get here. Drive along the A100 urban motorway in the direction of Flughafen Schönefeld/Dresden (this becomes the A113 after Grenzallee). Take the turnoff for Adlershof and then follow the road on Ernst-Ruska-Ufer in the direction of Köpenick, parallel to the canal past two sets of traffic lights. When you reach the third set of lights, turn left into Adlergestell. When you come to the S-Bahn station of Adlershof, turn right into Dörpfeldstraße and follow the road ahead (the street name will become Ottomar-Geschke-Straße). When you reach the petrol station, turn left into Oberspree-Straße. When you reach the first traffic light, turn right into Spindlersfelder Straße (Schnellstraße). After Spreebrücke (the bridge over the river Spree), turn left into a road called "An der Wuhlheide". Then take the first right into Straße zum FEZ. Drive under the railway bridge and then turn into the FEZ Berlin's car park entrance. Follow the direction of Flughafen Schönefeld. When you reach the A117 junction, turn off in the direction of Berlin Zentrum (Alexanderplatz)/Treptow. 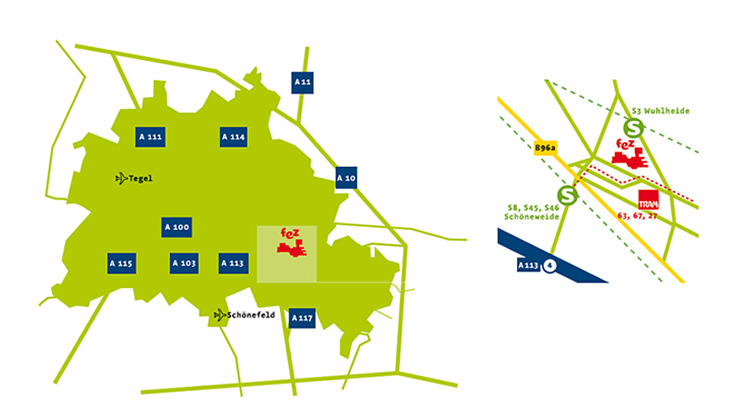 Drive past IKEA and then keep an eye out for the B96a in the direction of Friedrichshain. Take it, and after 3km or so you will come to the S-Bahn station of Adlershof. Turn right into Dörpfeldstraße and follow the road ahead (the street will become Ottomar-Geschke-Straße). Turn left at the petrol station into Oberspree-Straße, then at the first traffic light turn right into Spindlersfelder Straße (Schnellstraße). After Spreebrücke (the bridge over the river Spree), turn left into a road called "An der Wuhlheide". Then take the first right into the Straße zum FEZ. Drive under the railway bridge and then turn into the FEZ Berlin's car park entrance. When big events are on in the FEZ Berlin or on the Kindl stage, we recommend you use public transport to avoid having trouble parking!